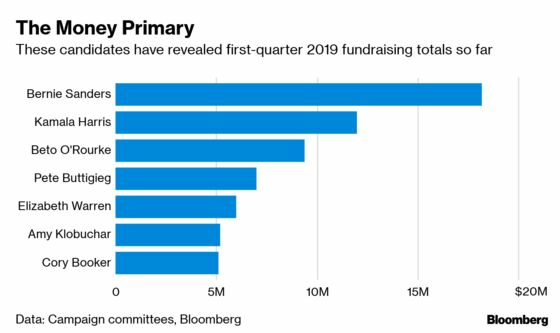 (Bloomberg) -- The money race in the 2020 Democratic presidential primary is so far more Walmart than Tiffany. The biggest war chests, according to the candidates’ self-reported figures, have largely been amassed in increments of $200 or less, and primarily online. Candidates are making a virtue out of the modest amount of their average donation -- as low as $20. They’re also swearing off money from corporate political action committees and deep-pocketed donors who can give the legal limit of $2,800, but whose checks can come with an expectation of access and favors. Much more will be known after Monday’s Federal Election Commission deadline for first-quarter disclosures of money raised and spent by the presidential candidates. But some even say they’re refusing to attend fundraisers where wealthy hosts and their friends pay large sums to sip wine with presidential hopefuls at glittery events -- the opposite of the image Democratic candidates want to project to primary voters. The low-dollar emphasis could be altering the tone and complexion of the race. Contributors making small donations online tend to be younger and more progressive than those who write bigger checks. By disengaging from establishment donors, the field is freer to shake up the status quo and espouse more radical positions, such as Medicare for all, a carbon-free economy and job guarantees. But can low-dollar donors keep Democratic candidates flush for the long haul? Skeptics abound, among them some of the party’s most generous givers. “There’s only so many small-dollar donors,” said Vin Ryan, a major Democratic contributor. With 17 declared candidates -- so far -- seeking money from the same pool of givers, he thinks their impact will be diluted. On the campaign trail last week in Iowa, Beto O’Rourke, the former Texas congressman, said he’d like to power his entire campaign on small donations, but didn’t rule out a role for larger contributions. "I don’t know what will happen, but I’m going to do everything I can to sustain it based on small-dollar donations," he told reporters. Some candidates already are quietly looking to those with deeper pockets to build war chests big enough to sustain them through the early 2020 cross-country sprint of contests. Those will take place in at least 14 states -- from the Feb. 3 Iowa caucuses to Super Tuesday on March 3 -- and promise to sort out winners and losers earlier than in past years. Andy Spahn, a veteran check-bundler who has arranged some of the biggest political fundraisers in Hollywood, said he’s heard over the last 12 months from almost every candidate running or considering running for president. The emphasis on low-dollar donors differs from past presidential elections, when Democratic candidates mostly tapped Wall Street, law firms, lobbying groups and Hollywood, according to data from the nonpartisan Center for Responsive Politics. In 2008, Barack Obama raised more than $1 million from executives of Goldman Sachs Group Inc., almost $850,000 from JPMorgan Chase & Co., and nearly $760,000 from Citigroup Inc. All ranked among his 10 biggest sources of funds. Eight years later, both Sanders and Trump pummeled Hillary Clinton for taking money from Wall Street. 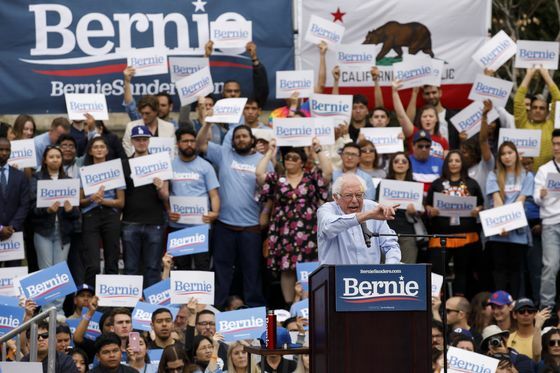 Senator Bernie Sanders of Vermont, a self-described Democratic socialist who is leading in the polls among declared candidates, said last week his campaign had raised $18.2 million over 41 days from 525,000 contributors. He tops the field among candidates who have pre-announced ahead of the FEC deadline. Among the candidates who have shared numbers before the filing deadline, Sanders has claimed the lowest average donation, $20. He’s followed by Senator Elizabeth Warren of Massachusetts at $28, Senator Cory Booker of New Jersey at $34, Mayor Pete Buttigieg of South Bend, Indiana, at $36, Senator Amy Klobuchar of Minnesota at $40, O’Rourke at $43 and Senator Kamala Harris of California at $55. Some candidates cited only what they had received online, so their average donation could turn out to be higher. Those who have sworn off corporate PAC money include Sanders, Warren, Harris, Booker and Klobuchar. Some, such as Sanders and Warren, are also refusing to hold fundraisers, which allows them to spend more time on the campaign trail. But that could also limit their money-raising success, which will be an important metric for Democratic candidates hoping to win the right to challenge President Donald Trump, who’s planning a much-better funded campaign than his last effort. Trump shattered small-dollar fundraising records in 2016 by harnessing the energy of the GOP base and by selling Trump-themed merchandise online and at rallies. His re-election campaign and affiliated committees have continued to pull in tens of millions of dollars in amounts of $200 or less. A successful candidate will need to build a network of major donors during the primaries to compete with Trump, said Democratic donor Ryan, who also supports efforts to get big money out of politics. “You can’t give all the guns to one party,” said Ryan, who founded private-equity firm Schooner Capital LLC. Some fundraisers also predicted the low-dollar dependence will lift once the Democratic field shrinks. "It’s impossible for me, right now, to do what I do until it’s a much narrower field," said Allan Berliant, a Cincinnati-based fundraiser who supported Obama in 2008 and 2012 and Hillary Clinton in 2016. The evolution toward smaller individual donations has been more than a decade in the making, following online fundraising success by Democrats Howard Dean in the 2004 election and Obama in 2008. Both faced better-connected competitors, but were able to raise enough money online to be competitive. Today’s flood of money is coming largely through ActBlue, a political action committee that provides digital fundraising tools to Democratic candidates and causes. It has raised $2.5 billion since 2004 for federal elections, according to the Center for Responsive Politics, with more than half of that coming in the 2018 midterm-election cycle. All of the presidential candidates currently raising money use the platform, which has a donor base of more than 6.4 million people who’ve stored their payment information on the website. That allows them to contribute with a single swipe on a smartphone. There’s no comparable service for Republicans, though the GOP is trying to catch up: In January, party leaders and Trump campaign officials agreed to create a new venture called Patriot Pass to process online donations. Because ActBlue can also be used to make a legal-limit contribution, it’s hard to know precisely how much is coming from small donors until the FEC reports are filed. Even if a small percentage of donors gave $2,800, it could add up to a significant chunk of total dollars raised.